as i am keen to point out whenever the ugly subject rears its head, i am not now, nor likely to be in the future, the subject of any training regimes. as far as i'm concerned, provided i can keep up with the mighty dave t and lord carlos, i'm going quite fast enough. and if i find myself a trifle fatigued after the post ride sprint, the caffeine under my cup of froth seems the equal of getting me home before undue effort might be required. it's not as if the opportunity has failed to present itself. i have almost an entire bookshelf of volumes that proffer their services on my behalf; the only qualification being that i have need of reading their chapters and putting into practice that which they advise. what could be simpler than that? and should i consider human intervention in my hypothetical, yet highly unlikely training schedule, i have a good friend in james maccallum who is now an intrinsic part of train sharp and resident north of the border. so it would be iniquitous of me to put my lack of training down to any lack of opportunity. however, at the pointy end of competition, all athletes suffer the consequences laid down by the law of diminishing returns. a couple of months of serious effort would likely see me leave the mighty dave and lord carlos wallowing in my dust, whereas the same two months might not place vincenzo nibali a similar distance ahead of his nearest competitors. run the latter scenario to its ultimate conclusion and even taking individual strengths and weaknesses into consideration, there might be more than just the occasional need for those finish line cameras. which is where, i believe, steve peters may have entered the equation for both the british cycling team and one or two of the folks at team sky. it's all very well concentrating on the physical attributes of the individual athlete, but might it not make every bit as much sense to take at least a cursory glance at the mental aspects? how many of you have set out on the bicycle, intent on training, simply riding, or even popping along to the coffee shop, yet finding sections of the ride that you don't actually remember passing by? such a situation might not be of too much concern on the coffee run, but if you have specific training goals to undertake, not concentrating on the job at hand is unlikely to lead to the hoped for improvements. the problem is that your head has an agenda all of its own, with unwanted thoughts occupying its every waking moment and perhaps one or two of those when it's sleeping. it's a situation that happens to us all, and the only realistic way round it is to find some way of quietening all that head-noise, leaving the way clear for concentration on the physical. and while i've specifically targeted this at the act of cycling, it's something that is every bit as valid in the day to day mundane existence. meditation is one option that could be seen to address this, and in a manner that exists as a solution to many of today's problems, there's an app for that. 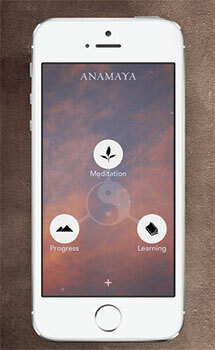 the basic solution offered by anamaya is a free downloadable app available from apple's itune's store. "On a daily basis, we are tossed around by our minds: thoughts come up to bother us, to remind us of things we should be doing; emotions such as anger and worry upset us. stress boils up in us. We are constantly bullied by our minds. What we would really like is relief from that." under study by great britain's 24 hour running team, meditation seems likely to be every bit as effective to the ambitious cyclist. this method covers the basic concepts of meditation and their relationship with relaxation, concentration, worry, stress; all the usual suspects. 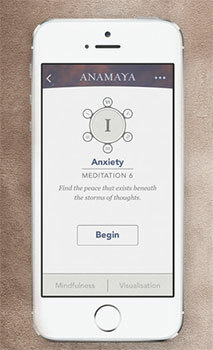 starting the app on your iphone (i had to borrow one) provides options regarding 'why meditate, using the app, setting up and meditation tips. at the base of the screen are the two words 'mindfulness' and 'visualisation', neither of which are available until after you've undertaken the basic introductory sitting. each session is accompanied by a soothing male voice, though i cannot deny that at times, at least during the introductory meditation, i found this mildly irritating, apt to underline a concept (concentrating on the breath) perhaps just a few times too often. once i know what i'm doing, i know what i'm doing. and rather contradictory to the concept, i would have thought, is a progress percentage, a feature that will likely increase even if you simply leave the app playing with headphones plugged in while you watch repeat episodes of the big bang theory. i was under the impression that meditation takes as long as it takes and not a practice that lends itself to quantification. 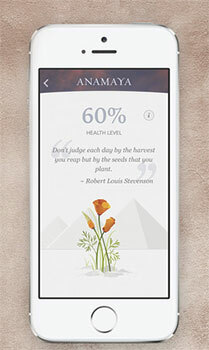 however, that is perhaps an unfair accusation, for in essence this is an ideal introduction to the art of meditation, with 'in app' purchases that allow the practitioner to progress at their own speed, needs and abilities. 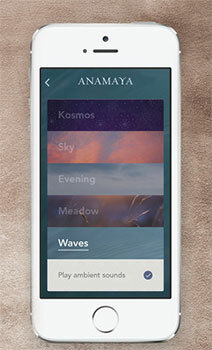 once into the depths of the app, there's a timer to set the duration of each session and the ability to play ambient sounds to aid concentration. there's no need to dress in saffron robes and light incense sticks; meditation is every bit as much 21st century as it is new age, with many positive and quantifiable results. since the app itself is free, with no compulsion for further purchases unless you find yourself convinced of its effectiveness, what's to lose? and just like the health benefits accrued from riding your bike, the results are just as applicable to the daily travail.